Routesetting: The Rabble Rouser — Terra Firma Bouldering Co. This is your first time making an appearance on the blog. Can you tell us a bit about yourself and your vision for The Rabble Rouser? Sure, hi, I’m Cody, I’m the owner here at T-Firms. I grew up in Michigan, moved around quite a bit, skateboarded most my life, went to art school, fell in love, painted a lot, became a father of a beautiful daughter and now i’m in the bouldering industry. I look over everything here, I try to keep everyone challenged both in their job and existentially, haha! The Rabble Rouser was really just a way to be creative in something that we love. Everything from the art direction, operation management, and setting. You can grow a lot learning how to negotiate all those practices. Everything about planning and prepping for a comp is new to us so we’re just striving to see what it’s like. My vision was to start a conversation, to find a starting place and see what we could make of it. There are not a lot of comps in the midwest, let alone independent ones. We knew that if we were to have one, we wanted it to compete not only at the local level but the national level. Making it an experience, well-designed and intoxicating was really rewarding. The final product was amazing and as an owner you want to be able to stand behind what you're serving. With our setting crew, I was able to sleep well that night. What little amount I could, haha! Okay, can you explain to us why you chose the setters you chose? The real reason I picked the team of setters we had was because of their passion. One cannot truly see what their potential is if they’re not willing to be consumed by what they put their energy towards. Tony, Mike, Doug, Corey and Brendan all care tremendously about their craft. They look at it like art, which it is. I respect that, I know that I can have certain expectations of them and that they’ll work hard towards that. Surrounding yourself with people willing to be consumed with their part of the endeavor makes it more likely you'll put all the brush strokes together beautifully. What is your future vision for The Rabble Rouser in the context of setting? I want the comp to always be a platform for creativity. To challenge ideas, work together, and make it a gallery show for these artists. What’s interesting about setting is its impermanence; sets rotate constantly and new problems are created. Setting can be personal as much as it’s impersonal, it’s functional yet challenging. A competition gives a brief moment of time to elevate the discourse of setting. It’s with that tension that setting becomes more interesting. These are the qualities I hope that the Rabble Rouser can continue to encourage. Tell us who you are and a bit about yourself! My name's Brendan and I’ve been climbing for a little over five years now - setting off and on for four of those years. Besides my main passion revolving around climbing, I enjoy hiking, hunting, fishing...Pretty much any activity that gets me outdoors. Setting for The Rabble rouser was different than any other set we’ve had at Terra Firma. Tell us what made this set different. Setting for this competition was different because we brought in multiple routesetters that have different abilities and unique qualities. This really manifested itself in the setting process and the results were a very well rounded competition with many different styles of climbing being present. One thing that also made it different was the use of our new volumes that we made ourselves! We ended up making a couple of very large volumes that really changed the walls up, as well as the smaller ones made for some very interesting problems. Another thing that was brought to the table was Rock Candy being generous enough to have made us their competition of the month and supplied us with the NEW mesa’s which were used for one of the men’s finals problems! Share a few things you’ve learned from setting The Rabble Rouser and how those things will impact your future setting. A lot of times its hard to put into words what you can learn from others in the routesetting. Having very talented setters come out to our gym for a competition is very helpful. Each person brings a unique aspect of setting to the table. Just by watching, you can learn what that person’s philosophy on setting is. One thing that I did learn was how to organize and run a large competition that involved both a redpoint and a open finals round. Involving many tricks that Doug, Corey, and Tony happily helped us out with! My name is Michael and I’ve been climbing for over five years now - setting for two years. Climbing has made a significant impact on my life. The fact that my career revolves around what drives me most in my life couldn't make me happier. I grew up playing basketball, baseball and other sports in High School! Some other hobbies that I enjoy include, playing Magic The Gathering, Snowboarding, Drumming, Golfing and hanging out with my family. What was your favorite part about setting for The Rabble Rouser? Learning to work with such talented routesetters is always a great opportunity for me. I like to become a sponge and soak up all the knowledge I can to help understand and perfect my craft. The relationships you build with these people truly last a lifetime and I know that I can always count on them for anything moving forward. The Rabble Rouser was the perfect gift to give back to the community. Without the community, The Rabble Rouser wouldn’t exist. Again, working with talented routesetters opens up your creativity and a better understanding of movement. Each setter has their own strengths and weaknesses, which helps identify your own personal weaknesses and strengths in setting. It’s taught me moving forward to never grow complacent in my craft and that there’s always room to grow, not just as an individual, but as a TEAM! My name is Tony Accuardi, I work for Rock Candy Holds and Rock Mill Climbing! I split my time between the Account Manager position at Rock Candy, and the Head Routesetter at Rock Mill. I sort of stumbled upon climbing looking for a way to stay active during the summers, and once I discovered route setting, well that’s all she wrote as they say. You came to this comp representing Support Your Local Routesetter. Can you tell us a little about that program and why it’s so great for our community? Sure! So the Support Your Local Route Setter Program has a special place in my heart, it is kind of my baby in a way. The program came about in an attempt to be a bigger contributor to the events Rock Candy sponsored each year. After my first year at Rock Candy, I just felt like we could do more. With majority of the events requesting free climbing holds, a few shirts and stickers just did not feel like enough. The program is special because it was truly designed to get new holds into route setters hands around the US for their events, at no cost the host. We really wanted to give a back bone to Rock Candy motto. In addition, we sponsored 3 route setters from around the US. Each setter received all of the route setting gear Rock Candy offers, and has the ability to order two full series at cost from us each year. I think the program is great for the community because it is empowering route setters around the country. 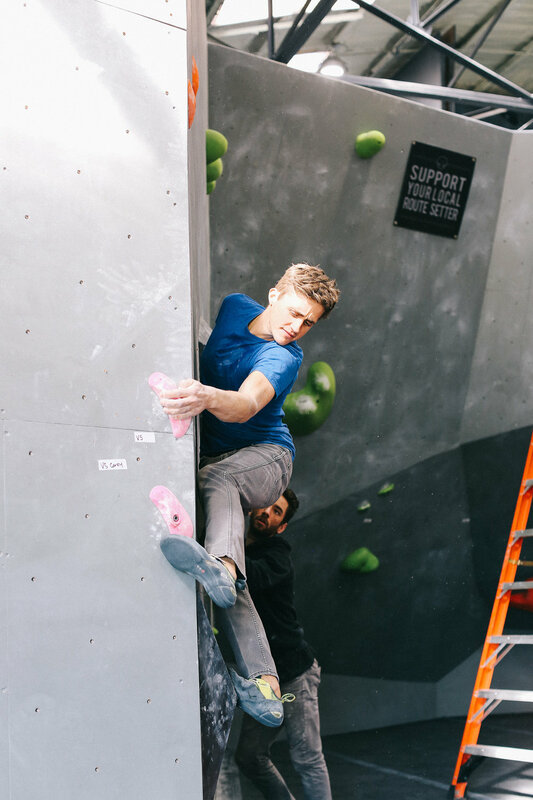 In 2017, the program sent free holds out to over 20 events. This year, we are building on last years success, and Rock Candy will be releasing a new series each quarter through the program. We are excited to be debuting our new holds with route setters around the country! The Rabble Rouser was great experience for me. The comp was only the second Onsight format I have ever set, and being able to lean on Corey and Doug was critical. Those guys have been in the game for a lot longer than I have, and I always value the opportunity to work with seasoned route setters. Most importantly - I learned that Doug is the slab master. Hey, I'm Doug DiJulio and I'm the Head Setter at Planet Rock Climbing Gym. I'm a mediocre rock climber, a poor guitar player, and an even worse skateboarder. I got into climbing because golf is far too frustrating, and rock climbing seemed like a natural progression from golf. I also do entertainment rigging on the side, so if you've gone to a show in the metro Detroit area and nothing fell and crushed you to death, you can thank me for that. You have been setting for quite some time. Would you share with us a few things you keep in mind when striving to design a successful route? I think that successful route setting is all about knowing your clientele. It's not necessarily about what I or the other routesetters want to climb, it's about setting routes that people are drawn to and will come back day after day to try. 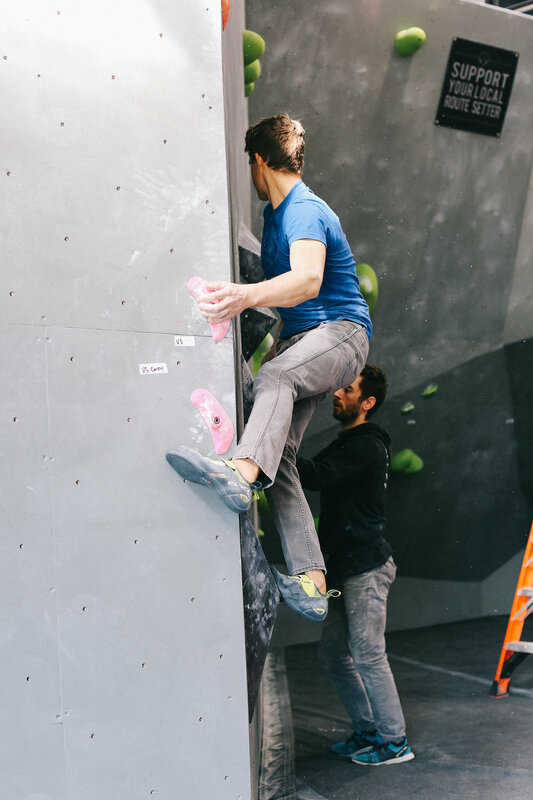 I'm very much about trying to give people the best experience I can when they come into our gym, whether they're first time climbers or 5.13 crushers. How is setting for a competition different than setting for regular day-to-day routes? Setting for competitions, in my opinion, is all about the show. The moves should be crazy, the positions should be weird, and the routes should make people think about rock climbing in an “outside the box” type of way. In a commercial routesetting environment, the routes are climbed and tweaked by other setters, but not to the same extent that competition routes are. 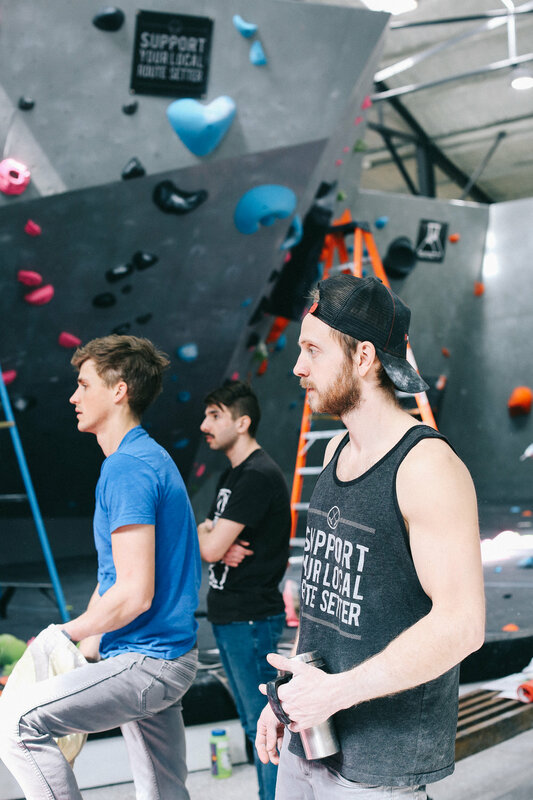 The best thing about setting for competitions is that all of the routesetters get to come together to make the set of routes or problems ultra unique, and create an event that is as fun to participate in as it is to watch. I’m a route setter and artist from Detroit. I’ve been on the setting grind for ten years, and I’ve been painting since birth. You are a visual artist outside of routesetting. Can you tell us how art influences your setting? Aesthetics to me is a huge part of setting, and I use similar principles in both practices. For example, I’ll maintain a discipline of contrast alignment and repetition in both, it’s really only the medium that changes. All the guys I set with always tell people that I’m not setting with plastic holds rather painting pictures with them. What was your favorite moment during finals at The Rabble rouser? Jon Brock is a good friend of mine, and when he sent men’s #4, a brilliant problem set by Tony, all the setters erupted and we all rushed Jon for hugs and high fives which was really exciting. If he wasn’t so jacked, we probably would have hoisted him on our shoulders and paraded him through downtown Grand Rapids.